From left, Eric Felitto and Mike Bertanza, co-owners of The Tasty Yolk. FAIRFIELD — Mike Bertanza and Eric Felitto met in third grade at Stratfield Elementary School when the former sent a ball over the school’s roof during a kickball game. Years later, they’re on a different type of team. 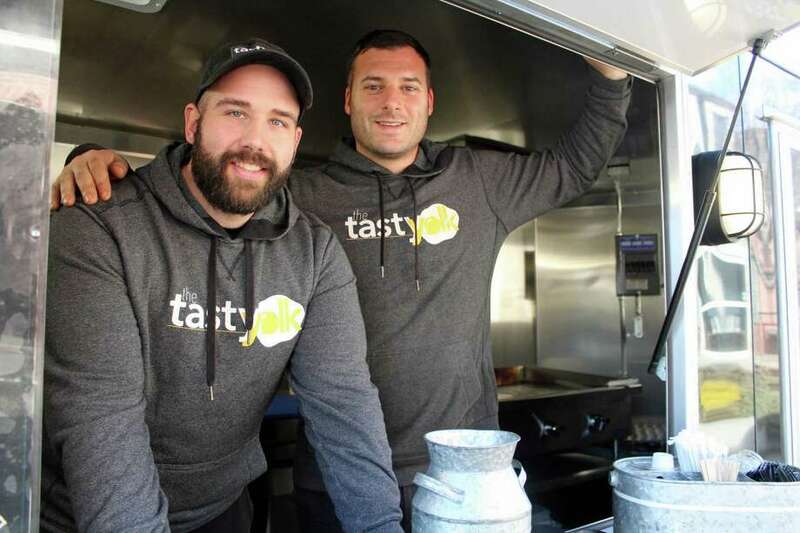 The two 33-year-olds have opened their third Tasty Yolk food cart on 1916 Post Road — their first in their hometown of Fairfield. “This location has been great. We’ve seen a lot of repeat business from the Fairfield Avenue business and there’s also a lot of families in the beach area. We’re closer and more convenient for them and word is also getting around,” Bertanza said. The food cart hummed and churned steadily on a recent afternoon, the aroma of cheddar, pepper jack and swiss cheese wafting out into the street. A rack of white eggs laid in wait in one corner of the cart. Its location at 1916 Post Road sits right in front of a market that closed some time ago. Though Bertanza and Felitto said the commuting crowd is a hard group to get given their fast and timed routine, people with later commute times and neighbors are passing by the food cart more often. The other two locations at 4700 Park Ave. and 2889 Fairfield Ave. are in Bridgeport. The duo’s business venture started back in October 2015, though their first trailer didn’t launch until May 5, 2016. Bertanza was a local banker and Felitto a chef at The Chelsea, where he still cooks. There were days at the beginning of their business venture, both Bertanza and Felitto admitted, when traffic was slow and they weren’t sure the food would be popular. Their full-time gigs at the time, however, were a comfortable cushion for them to fall back on. “We were fortunate to have full-time jobs. We had the time to wait it out. If we had just quit our day jobs and invested all of our money on the business, we would have been freaking out,” Bertanza said. The Tasty Yolk menu includes items like the Tasty; The Banker, a steak and two-egg sandwich with spicy aioli and swiss cheese; and The Slenderizer, a spinach tortilla wrapped around sauteed spinach, mushrooms, two eggs and swiss cheese. Tasty Yolk gets its bread from Arthur Avenue in the Bronx and their chorizo from Custom Meats, a butchery across the street from their Fairfield food cart. Now with three food carts, there are plans to expand the business.